Goethe once said: “Tuscany is not in Italy but Italy is located in Tuscany”. Thus, the poet explained that the Central Italian region has a very special attraction. As well as a coast stretching over 328 kilometres, the unique landscape especially attracts people to Tuscany. Olive trees, cypresses and miles of fields. But hardly any other region in Italy offers such a large variety of cities. Florence, Siena or Pisa are among the most famous places. Lucca is a provincial capital and is situated in the heart of the country between Viareggio and Florence. Lucca is also the hometown of the composer Giacomo Puccini and a special architectural showpiece, which is located in the Piazza dell’Anfiteatro in the centre of the city. Not far from Lucca are the picturesque hills for which Tuscany is known. 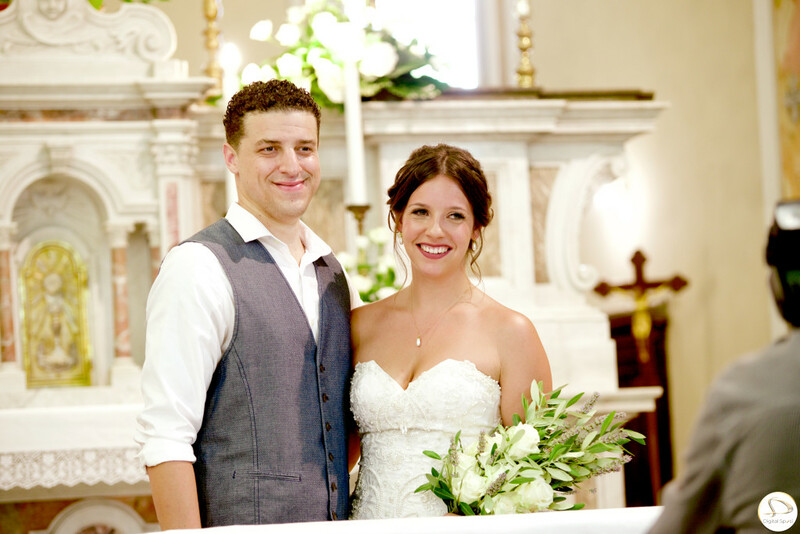 For our wedding couple Chelsea and Ryan, it was just the right place for a romantic summer wedding in one of the area’s historic villas. The two Americans, their closest friends and relatives spent a week in an ancient villa, where they also celebrated their wedding during the course of the trip. Together with their friends and relatives they enjoyed the pool, BBQ and the beautiful villa’s Italian garden for a perfect holiday week in Italy. But the wedding celebrations program also included small city tours. Pisa and Florence are not far from Lucca and both cities offer an outstanding day trip. Art lovers coming here are spoilt for choice as well as all those who like to shop the latest Italian fashions. All the wedding guests found the perfect outfit for the wedding with the latter. Chelsea said I do to her Ryan in an ecclesiastical ceremony as well as at a wedding ceremony in the historic villa’s garden. 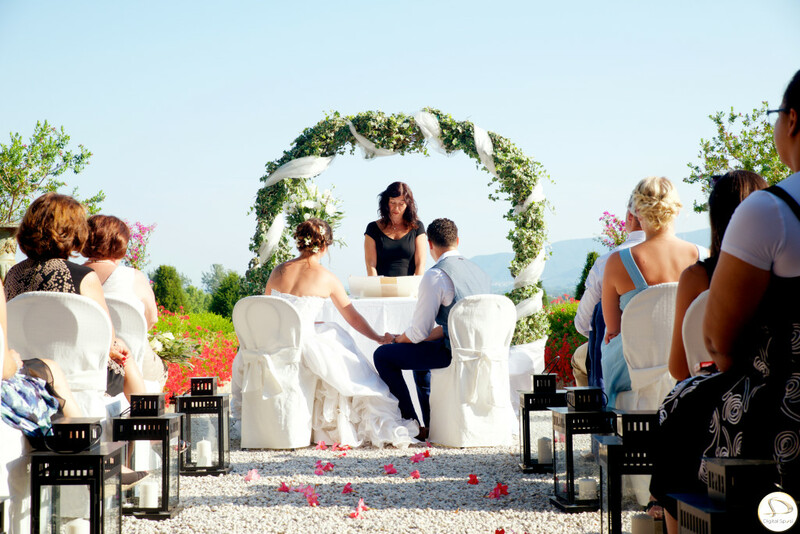 This is park-like and offered the opportunity to arrange the wedding altar with a view of the picturesque hills and the shade of the villa. Musically, a violinist accompanied the bride’s entrance. There were typical Italian food and wines from the region set out on the elegantly laid out, long table – an Imperial table – for the wedding couple and their guests. 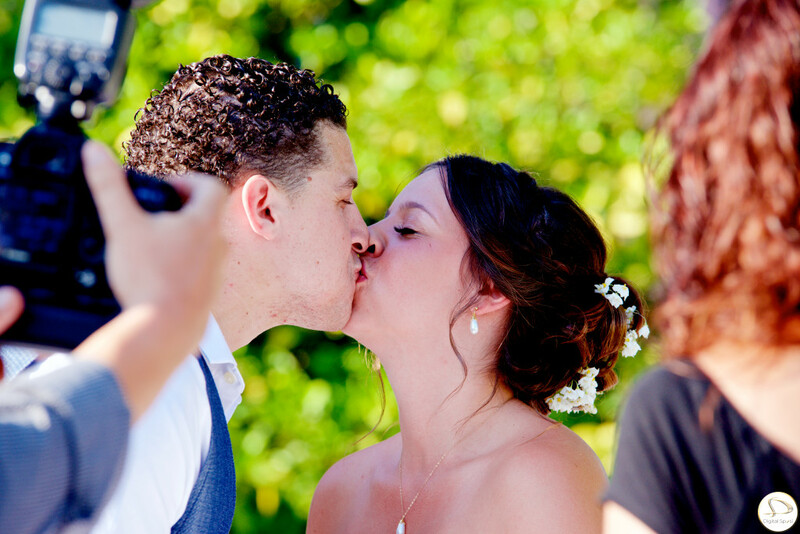 We were able to offer Chelsea, Ryan and their guests a total package for their wedding in Italy with the villa wedding. 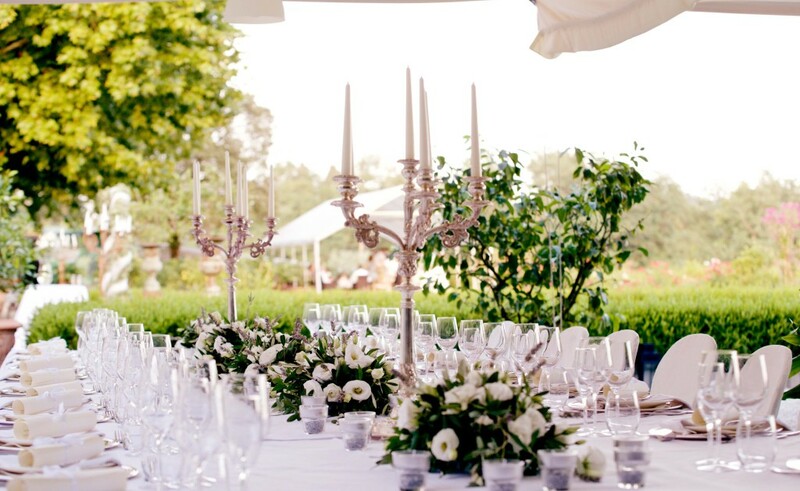 The estate in the Lucca hills provided an ideal setting for both the holiday and the festive wedding.